OpenLM supports license monitoring of a wide and ever growing variety of license managers, such as FlexLM and DSLS. This application note elaborates the steps required to configure OpenLM to interface the IBM LUM license server, to monitor license usage and denials, and obtain license statistics. 2. Set the timezone to where the License Server physically resides, e.g. Eastern time. 4. Is Triad Configuration: When using Triad server option, check the “Is Triad configuration” box. 4b. Specify the different cluster’s server names and respective port numbers, one beneath the other, in the ‘Hostname’ list. 4c. Here is some general information on LUM cluster configuration and activation, from the license servers’ perspective. Checked (Default): The OpenLM Server actively queries the license manager. Keep this box checked, unless using the OpenLM Broker to query the license server locally (see below). 6. Click Apply, and the consequent “Restart now” button. 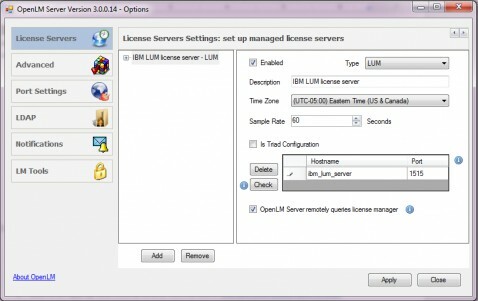 The IBM LUM server is now ready to interface OpenLM. Employ the OpenLM Broker to send IBM LUM usage data to the OpenLM Server. Improved robustness: License usage information will be buffered in case of connectivity failure. Denial reports. The OpenLM Broker will extract license denials information and propagate it to the OpenLM Server. The IBM LUM Server enables other machines to query license usage and perform actions remotely. For a full install procedure please consult the Using License Use Management Runtime document. The following list is a short overview of this procedure. 2. Install the LUM client software on the OpenLM Server machine. There is no need to configure the OpenLM server machine as a LUM server. Note that if you use the Server’s IP instead of its name (for instance if the servers are located on different DNS domains so that DNS resolution does not work), a ‘#’ symbol must precede the IP. This solution is simple and very beneficial (see above) but requires access to the license server machine for installation. The OpenLM Broker queries the license usage information locally and pushes it to the OpenLM Server. The OpenLM Broker is a Java application, and can therefore run on Windows or UNIX / Linux license servers. Installation of the OpenLM Broker includes the installation of Java JRE. 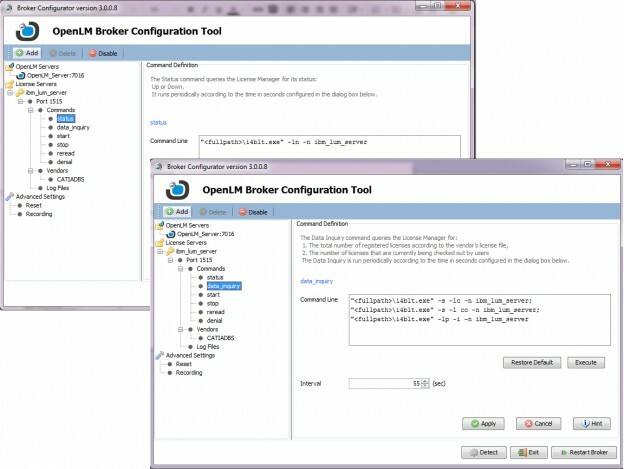 Please refer to the quick reference OpenLM Broker Application Note for installation information. The OpenLM Server configuration will be exactly the same as performed in the previous method, i.e. without the Broker, except that the “OpenLM Server queries license manager” check box should be cleared. 1. 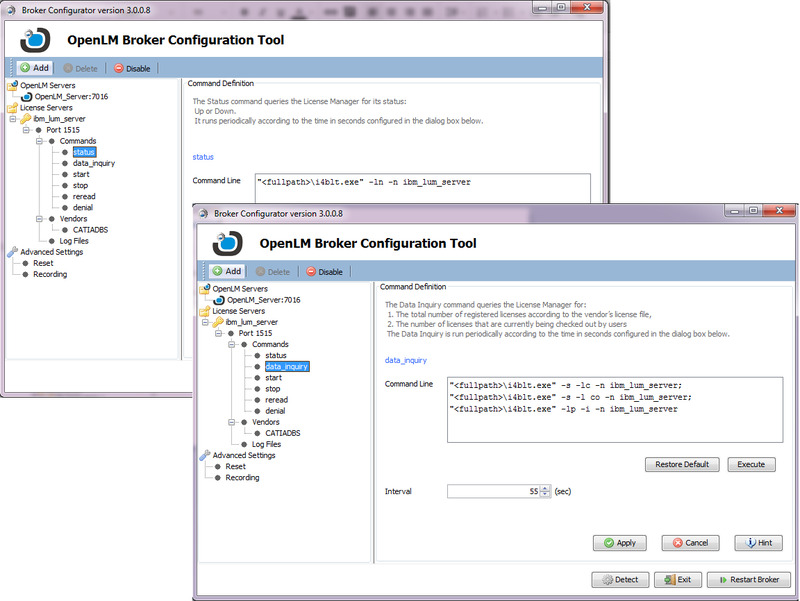 Download and install the latest OpenLM Broker version. Follow the installation instructions on the OpenLM Broker Application Note. 3. The ‘Status’ and “data_inquiry” commands should be as depicted below. Replace <fullpath> with the actual path of the i4blt executable on the IBM LUM license server. As mentioned above, executing this command will obtain the cluster’s member server names. 1. Open the EasyAdmin web application. 2. Click EasyAdmin Start → Widgets→ License servers. The License Servers window appears. Verify that the configured license managers appear on the list. A green circle node indicates an active connection to a license server. IBM LUM license denials will be presented in the EasyAdmin web application → Reports → Denials. Note that they are subject to “True denials” filtering. That means that denials’ reporting will be delayed for a while, to assert that the user has not been granted a license shortly after being denied one. Your OpenLM system is now configured to provide IBM LUM licensing information. If you require further assistance on this subject, please contact support@openlm.com , and our team will be glad to assist.